As we age, remaining physically active can become more difficult and exercise seems as though it takes a greater toll on our bodies. In fact, those are precisely the reasons as to why it’s so important for seniors to continue exercising. There are tons of benefits in staying physically active as you age, from reduced blood pressure to lower stress levels and diminished symptoms of anxiety and depression. The amount of benefits from exercise can go on and on. Below are some great ways to promote healthy aging through physical activity. It may not seem like much, but even walking around the house can make a huge difference in heart health among aging adults. According to a Surgeon General Report from the Center for Disease Control, seniors who log any level of physical activity whatsoever markedly decrease their chance of heart attack and stroke. Cleaning the house, taking a stroll to the mailbox, and even walking from room to room are all low-level activities that make a big contribution toward heart and brain health. n a stage of life where one’s mental health is not where it used to be, confidence boosters are a must. These confidence boosters are even more productive if they’re accomplished through physical activities. Encouraging seniors to set challenging, yet easily attainable goals is highly recommended. Objectives such as “standing for 30 minutes a day” or “walking to the corner and back” can eventually evolve into more involved physical goals. In addition to stimulating brain and mental health, senior centers are one of the best resources you can find when it comes to keeping aging adults physically active 2. No matter where you are, there’s a strong likelihood that you’ll find a local senior center nearby. Nearly 10 million older adults utilize senior centers each year. These facilities not only offer volunteer programs and organize social outings, many offer exercise classes as well. It’s not uncommon for your local senior center to have trained staff on site available to teach aging adults yoga, Tai Chi, swimming, and general aerobics classes. Some centers have opportunities for seniors to learn how to line, ballroom, or even square dance, all of which are all great exercise options for seniors. Sports that require manageable levels of physical exertion are perfect for aging adults. Golf is a great example of a fairly accessible sport that promotes healthy aging among seniors, especially if they’ve been playing that sport throughout their lives. Even if a senior decides to use a cart, the sport still requires a moderate level of walking on grass that’s perfect for seniors looking to get active. Bowling, a casual game of frisbee, or tossing a tennis ball around are smart options as well. Every 11 seconds, a senior citizen is treated at the ER for a fall 3. Aging adults may be averse to the idea of physical activity because of a perceived likelihood of fall risk. In fact, physical activity and exercise can greatly prevent the risk of falls in seniors, as it heightens one’s agility and ability to react. That being said, there are some precautions to take when choosing the best exercises for fall prevention. First of all, talk to a doctor. The doctor can help identity the certain health conditions that can increase the likelihood of falls, including eye and ear conditions 4. Medications and history of past falls can influence the probability of a future incident. In the event that a senior is more prone to falls, supervised water workouts are ideal. Wearing the proper footwear is another safety tip for avoiding injury. Make sure the senior is wearing shoes that fit correctly and have proper tread. There are types of shoes that can decrease joint pain as well, so consider shopping around for footwear that is both safe and practical for exercise. Many hazards that affect exercises for seniors actually have nothing to do with the seniors themselves. 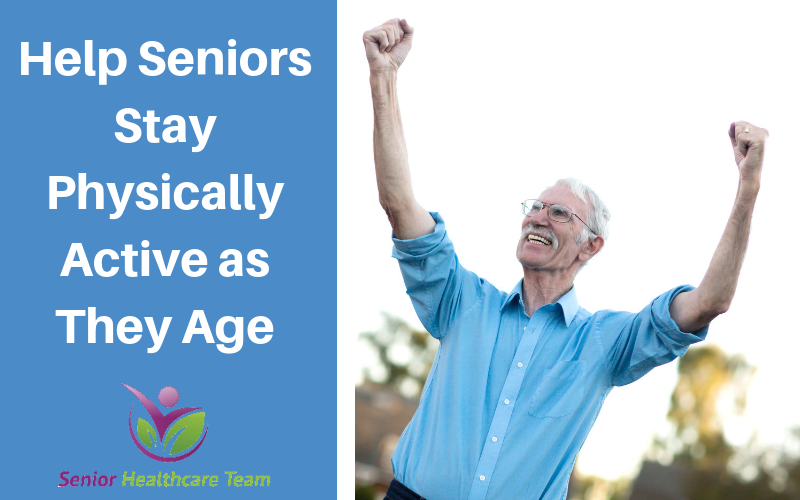 When coming up with physical activities, be sure the aging adult’s surroundings are safe. If it’s an outdoor activity, watch out for holes or errant balls when near a sports field. Additionally, if the weather is excessively warm, consider taking the activity inside. It’s important to note, however, that there can be dangers indoors as well. Remove glass tables or surfaces like small rugs or objects floors that can easily be slipped and tripped upon. Every bit of physical activity helps when it comes to healthy aging. Utilize local resources like senior centers, find an activity that piques the senior’s interest, and staying safe all contribute to a senior’s ability to enjoy life into their later years.